NEW YORK–Masbia Soup Kitchen in New York City is preparing for the Jewish holiday Passover by handing out emergency food packages of kosher for Passover. 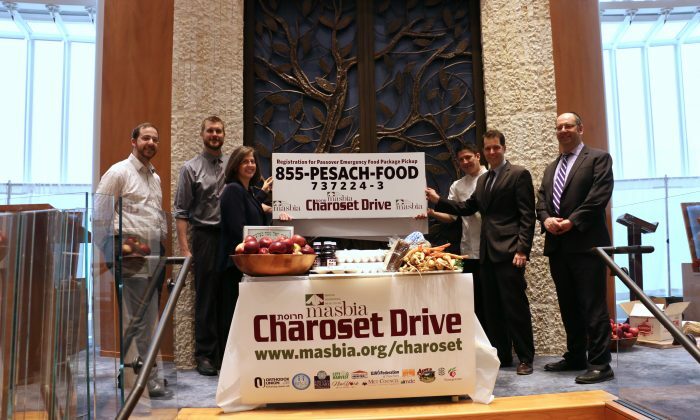 Last year Masbia handed out just under 1,000 Passover food packages. This year they are set to hand out 2,500. “Some of our previous partners and friends in the community that do emergency food and kosher for Passover food have shut their doors for one reason or another,” said Beau Heyen, the chief development officer at Masbia. He said that high unemployment, and the cost of living in New York City, combined with Congress making cuts to the SNAP (Supplemental Nutrition Assistance Program) program back in November have all contributed to the surge in people seeking help. Despite governor Cuomo making up for the cuts to the SNAP program, the number of people visiting soup kitchens has grown significantly. There is such a high demand this year that Masbia created a hotline to streamline the delivery process. They are expecting to provide holiday assistance to 2,500 families at a cost of $600,000. Each package contains enough meals to feed a family of four 3 meals a day for the eight days of Passover. While it is not meant to be a family’s only food during this time, it is meant to help families who are struggling to make ends meet. Passover, or Pesach in Hebrew, is an expensive time of year for many Passover-observing families. One reason is that the level of kosher during Passover is especially high, with many grains and meats normally eaten during the year being cut out. “It’s a challenge to be able to provide not only for having family in town and having everyone here, but your children aren’t in school, you’re going to be home more often, and a lot of the resources you turn to that have kosher items are going to be closed,” explained Heyen. Passover, from April 14th-22nd, commemorates the Jews’ exodus from Egypt over 3,000 years ago and the hardship they endured as slaves for over 200 years before they left.